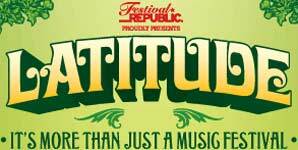 The pioneering, genre-defying, award-winning Latitude Festival takes place at Henham Park Estate, near Suffolk's stunning sea-side town of Southwold, organisers Festival Republic promise Latitude will be the perfect British summer destination. Latitude Festival is one of the best festivals - not only in the UK but anywhere in the World, the line-up always caters for a variation of people. Music, Poetry, Comedy and Film all have a place at Latitude. It's a festival where toddlers are as welcome as you usual music loving festival goer.